Except for drinking, you won’t catch most cats coming close to water. The closest thing most felines see to a bath is their own tongue. Although that’s enough for most cats, sometimes they need to be bathed or groomed because they got tangled or for medical reasons. 1. Be selective in how you’ll bathe your cat. Some cats prefer a shower, with their human holding them close. They sometimes find it more soothing than being held only in the arms. Other cats prefer a sink where they can be up high, while others would rather get in the bath tub, although some cats find a faucet aversive. Consider pouring warm water from a cup, or using an extended, flexible nozzle to give yourself more control. 2. Mind the water. Bathwater should be kept at the temperature comfortable for an infant. You might want to look into baby bath monitors to keep it save and comfortable for your cat. They can also great stressed out at the force of the water coming from a faucet, nozzle, or shower head; keep the pressure low, or use a cup as recommended earlier. Wet washcloths can be used as well. 3. Watch the face. Most cats are afraid of having their faces washed, so only bathe them from the neck down. To clean the face or sensitive areas like the ears, pet wipes are often better tolerated. Unless it upsets the cat, put cotton balls in each ear to protect them from water. 4. Place an anti-skid mat on the bottom of the bathing surface to give your cat a better grip. Many cats will panic when their feet slip, but if they have grip and stability, the struggle is often reduced. 5. Keep them calm. Try using lavender or chamomile scents in the bathing area, as they can keep you and the cat calm. Classical music, played softly, may help, too. Think spa! 6. Treats! If your cat will take treats, such as licks of tuna or soft cat food off a spoon, have a helper reward your cat during the bath. Even for cats who won’t take treats, petting, gentle massage, and talking can be soothing as well. Post-bath, find a ritual your feline especially enjoys. This could be a special reward given to them only after baths, such as a special type of food or extra special play session. Many times by pairing it with a positive after the bath time is better tolerated because of the anticipated reward to come. 7. Take it slow. For cats who are especially upset with baths, try getting them comfortable with the bathing area without water to begin with. Place the cat in or near the bathing area and reward for staying in this area with a session or play or palatable treats. If the cat is still freaked out even without water, try doing the training in an area near the bath, such as just outside the bathroom door or on the floor outside of the bath. Then, practice the training with water flowing in the bath but the cat outside of the area to get them comfortable with the sound of water. Also, practice the types of handling and holds that are done in the bath without water being used so the feline is accustomed to this type of handling. Only progress at a rate the cat stays comfortable with and is relaxed enough to enjoy rewards. 8. For cats who are fearful of running water, alternatives are available. Consider using facial wipes for the cat’s face and ear wipes for the ear area. Body wipes can also be used all over the cat’s body in place of a bath or between baths. For more thorough cleaning, the coat can be cleaned using a waterless grooming foam, which only needs to be applied and then toweled off for a deeper clean. While they may not be as thorough as a bath with water, they still remove many of the allergens collected on a cat’s coat, and will leave a cat smelling and looking fresh. In a similar fashion to a bath, a cat can be given rewards both during and after being wiped clean. 9. Be careful. If the cat is sensitive of certain areas being touched, such as paws, start with the areas the cat is comfortable with and clean those, such as only cleaning the back and sides of the cat. Then, gradually accustom the cat to having the sensitive areas touched by using a hand without a grooming product to begin with. Practice handling around the area in a manner the cat is comfortable with. For paws, this may mean handling the cat only near the shoulder to begin with and progressing down the leg towards the paw only as the cat remains relaxed with the handling. With ears, it may mean handling around the neck, head and base of the ears and only doing light touching and handling as the cat stays calm. Be sure to pair handling with rewards the cat finds enjoyable. Or, even do the handling in a manner the cat is relaxed with and follow up with a reward they already enjoy; like their meal, petting or a play session. 10. Drying time is relaxing time. 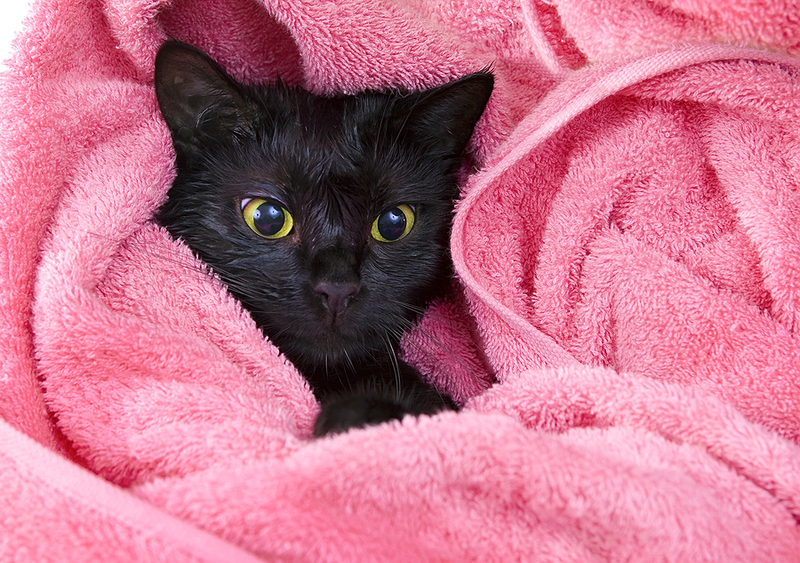 When a cat needs to be dried after a bath, those who are comfortable with handling often prefer to be held inside of a towel or two that can be gently rubbed to dry their coat. Or, if they are the type of cat who wants space immediately after the bath, if possible, towel the cat in the area where they can be contained, such as the bath or sink area. Then, holding the toweled cat, lower her to the floor where she can be released rather than jumping, which can cause anxious anticipation and result in injury. If needed, when lowering the cat, position her in a way where the towel is wrapped gently around her paws or hold her firmly by her side with paws facing away from you to lessen the chance of being clawed as you set the cat down.